Phoenix is best known for its heat and spring training. However, anyone who has ever visited the area knows that it's also got a sea of tract homes built just before the recession. If you happen to live in one of these homes and are looking for a way to differentiate your property from those of your neighbors, stamped concrete is an excellent choice. Whether you go for a stamped driveway or upgrade your back patio, you'll love the difference stamped concrete makes in the appearance of your home. Here is a list of concrete contractors in Phoenix. There are many different stamped patterns to choose from, including ones that mimic stone, brick and even wood. 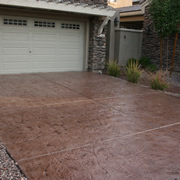 In Phoenix the most common patterns are Arizona flagstone and seamless texture skins. Arizona flagstone is made to look like sandstone quarried directly out of Arizona. Choosing this pattern will give you an authentic look that is at home in the surroundings. Seamless texture skins impart a stone-like quality onto the surface of the concrete that has no joints or pattern. With seamless texture skins it is popular to add decorative sawcuts to create a pattern of large squares or diamonds. 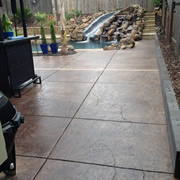 Stamped concrete can be poured in nearly any color. However, in Phoenix it is popular to mimic the warm colors of the desert. Browns, tans and terra cottas are especially common in the area. Most stamping contractors will use a combination of colors to produce the final effect. If you are unsure on color choice, ask if they can make a mock-up so that you can see exactly what you'll be getting. With the extreme heat of Phoenix, it is best to steer clear of dark colors that will absorb the sunlight and radiate heat. Another suggestion is to make sure the concrete is sealed with a product that will keep the color from fading in the sun, think of this as sun glasses for your driveway or patio.